Following the design style of Outlook 2013, Auto Reply Manager v3 introduces a faster execution engine and more Outlook auto response options. Finally, automatic rules with week days! The new version lets you automatically enable repetitive rules based on week days. For example, you can make an auto response to trigger only during weekends or between each Monday to Wednesday period. 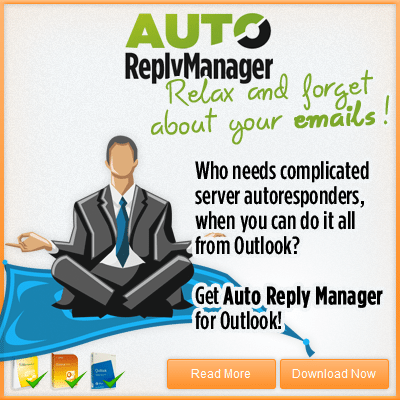 Auto Reply Manager v3 gives you the ability to manually execute your rules over previously received Outlook emails. On top of the auto reply, forward and redirect options, the new version of Auto Reply Manager allows you to automatically resend already sent emails, based on your custom rules. Now you can customize each automatic response with the subject line of the email you are replying to, so you don’t have to use the same old “Out of office” subject on all your out of office emails. – full support for Outlook 2013 (x32 and x64).